A little window into the dark side of being a fishing guide; framing houses in New England in January. Unfortunately, no fishing related news from the rock at this time. If I can get Dave out of the duck blind at any time in the near future hopefully we'll get the augers fired up and drill down for some sweetwater glory. Sadly I fear that getting Dave to disband his shotgun at this point in time is highly unlikely. In other news, the Rapone boys have just returned from a vacation to Key West in the midst of the worst cold front in the history of the world or whatever. Little tree huggers, they spent the whole time cleaning up the trash on the reef! Happy New Year from the entire Fishing the Vineyard crew! 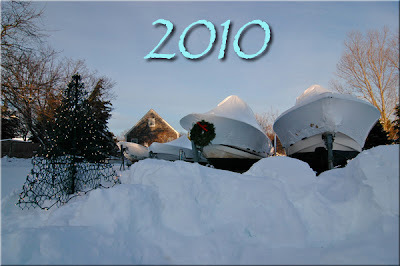 As 2009 comes to an end, we would like thank all of our customers and friends for a safe, entertaining, and productive year on the water. Here's to a healthy and fish-filled 2010. We hope to see you all on the Vineyard this coming season.